Listen up men. We have a great product we want to tell you about today. You can pretty much say this product does EVERYTHING. 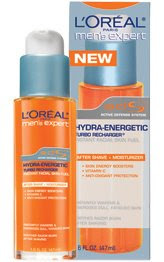 We are talking about L’oreal Hydra Energetic Turbo Recharger.Turbo Recharger is a facial moisturizer that soothes razor burn and skin irritation caused from shaving, but also invigorates, energizes and moisturizes your skin. How to use: After cleansing your skin apply all over face and massage in a circular motion avoiding the eye area until absorbed. Men We (Kiss and Wink) want you to have amazing skin that you can be proud of. We also know that you are hard working and extremely busy, therefore you need something convenient to use. With that being said we got you covered with Turbo Recharger. It’s one product that does everything that you need it to do to keep your skin in tip top shape. We give Turbo Recharger a Smooch and Three Winks. Guys check out Turbo Recharger and let us know what you think. Just for Kids, Hairstyles and Hair tips.